Some say breakfast of champions. I say breakfast of cheapskates. Some people were surprised to hear that our grocery budget goal for this month is $200. It clocks in quite a bit lower than the national “thrifty” average of $387 for two people. I’ll let you in on a secret. Part of why our grocery budget currently clocks in at the fairly low total of $250 is my morning food game plan that only sets me back approximately twenty cents a day. I rise before the sun every week day*, as well as on most weekends. As much as I claim to be a morning person, I’m still fairly catatonic that early in the morning, so I don’t eat breakfast at home during the week. Instead, I drink a glass of water while I’m getting ready, fix myself a cup of tea in my travel mug, and head to work. Once I’m there, that’s when I whip up breakfast. Each morning, I feast on a scoop of quick oats, a spoonful of flaxseed, and a dash of agave nectar to sweeten things up. If I’m really feeling fancy, I’ll toss on a few berries, raisins, or part of a banana that I’ve packed for a snack later in the day. Sometimes, if I am eating at home, I’ll vary up the routine with a sprinkle of some brown sugar or a dash of salt. But for the most part, I’m perfectly content with my relatively plain oatmeal. I know some people are gagging over their keyboards as they read this, but I assure you I wouldn’t eat it if I didn’t enjoy it. Oatmeal gets a bum rap, I’m afraid. For a long time, I had oatmeal filed away in my mind right next to prunes and castor oil. Then I actually tried it. For a while, I was hooked on the instant, already-flavored packets, but they seemed wasteful, a bit pricey for what they really were, and riddled with unpronounceable ingredients. So I switched to plain and then started adding my own toppings. $2.49/15 oz bag – Southern Grove Flaxseed also courtesy of Aldi…because where else can I buy flaxseed this inexpensively? I usually get between 30-35 servings from the oatmeal and the flaxseed. The sweetener lasts longer, but even if it didn’t that would still ring in at $7.87/35 = $0.22. So, that’s my $0.22 cent breakfast! Of course, the fruit toppings do make my breakfast a little more costly. But if I go that route, it’s usually to use up some berries that have ripened too quickly or to eat part of a banana that I’ll finish for a morning snack. Before you jump in and tell me that I’m going to get scurvy or rickets,** I assure you that I eat plenty of fruits and vegetables throughout the day. I also make sure to either toss in some almond milk with my tea or snack on some Greek yogurt to get calcium for dem bones. While it might not be the most perfect breakfast, it leaves both me and my budget quite satisfied. ***I did recently cruise past a new offering of organic oats on my last Aldi trip that I plan to check out next time I need to buy a new canister. Note: This post is not sponsored by Aldi. But it probably should be. Wink, wink, nudge, nudge, friends at Aldi. So Tell Me…Are you a breakfast eater? Have you ever crunched the numbers for your breakfast budget? I die if I don’t eat breakfast =) I usually eat a banana and some almonds. Today, I ate a banana, some almonds, and some raisins. The almonds are the expensive part! It’s definitely a splurge. Mmm…raisins. I can’t eat them out of the tub, otherwise they magically disappear in a single sitting. I with you on breakfast. My husband can take it or leave it, but I can’t function without breakfast. I’m hypoglycemic — although it’s better now that I avoid (most) sugary foods — so I need to eat as soon as I notice I’m hungry. Lately, that hasn’t been immediately upon waking up, which is new. So my breakfast of choice is peanut butter toast. Which ranks at or below oatmeal on the boring-meter. But it’s protein, so my blood sugar doesn’t dip. This actually makes perfect sense to me. There are certain things that have every reason to appeal to me, but I just can’t stomach. Cottage cheese, for instance. I just can’t. Peanut butter toast is delicious! I will sometimes make that if I’m home for breakfast and am needing to use up bread before it gets funky. Hey, if it works for you, there’s nothing wrong with eating oatmeal for breakfast all the time! And 22 cents per meal is awesome. I went through a period where I enjoyed having smoothies every morning, but getting that much fruit can be expensive. Smoothies are wonderful. If I were home and/or weren’t on total autopilot in the AMs, I think I’d consider going that route. As it stands, I am almost too impatient to wait for my Keurig to heat water before my mad dash out the door. Typically, I’ll whip up a smoothie after a long workout. It’s how I bribe myself! I think we all get into food routines at certain points, and this is a super healthy one! Way to be… Especially at that price point! I’m all in favor of routines, especially in the morning. Thanks! If you give it a try, I’d love to hear what you think. I love porridge/ oatmeal for breakfast especially in the winter. One of my favourite things to do it to put it in the slow cooker before I go to bed and then we have it ready in the morning with hardly any effort. 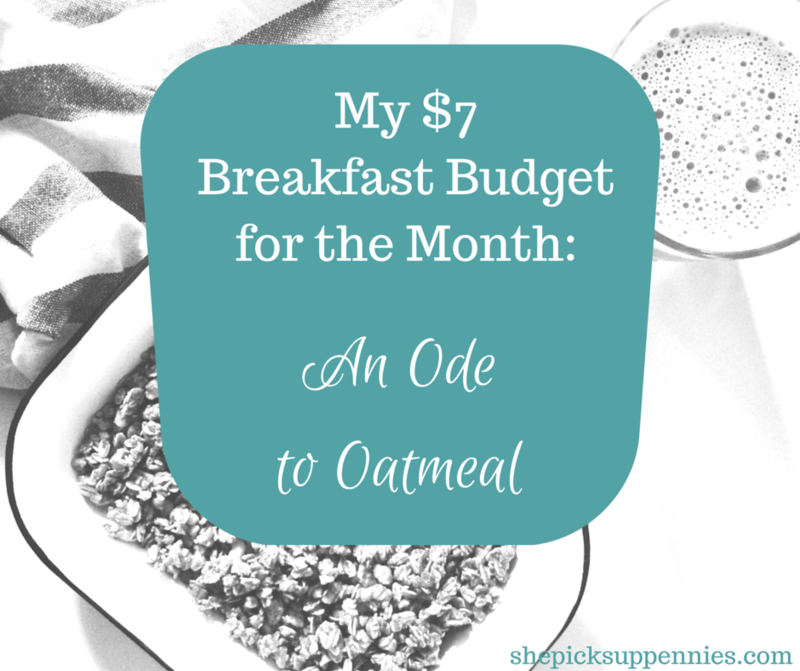 It is such a super cheap and easy option and we usually buy the oats in bulk to cut the costs even more. Overnight oats! If I could get Mr. P on the oatmeal train, I’d totally start testing out some of the great Pinterest recipes I’ve found for them. Do you have a favorite flavor or add-ins that you love? I do this too! Mine is oatmeal, cinnamon, a spoon of crushed nuts, and a chopped apple, cover with water, then in the microwave for 3 minutes. If I’m in a hurry, I scoop it into a travel mug and eat it with a long spoon once I get to work. It’s weird to not get bored with the same breakfast every day, but somehow I’m fine with it and it helps prevent decision fatigue. I’ll get really light-headed if I skip breakfast. But I guess our body adjusts. I think oatmeal is inexpensive but super nutritious. It can be delicious if you put in the right ingredients. It usually prepare it the night before. Your breakfast sounds so yummy btw! Big fan of oatmeal! Cheap, whole grain, fiber, endlessly adaptable blank canvas, what’s not to love? I’ve add raisins, maple syrup, pecans, walnuts, almonds, chia seeds, mix it with chai tea instead of water, coconut or almond milk, chopped apples, dates, prunes, basically any fresh/dried/frozen fruit… there is no wrong way to do oatmeal really, except to not do it. Here’s my question about oatmeal: I have tried eating it for breakfast and get hungry approx. 30 minutes later. Does your body just adjust? It really doesn’t fill me up at all!